Are regular tripods bending you out of shape? Flexible tripods can inspire you to take photos and videos at impossible heights and angles. They’re a great (and tiny!) addition to any camera bag. When you’re looking at flexible tripods, versatility is the name of the game. We’re talking about a tripod that can wrap around trees, hang from a bridge, or magnetically grip to the side of a cement mixer. These things can even bend into selfie sticks, hand-stabilizers, and shoulder mounts. Flexible tripods are the perfect companion for an impromptu shoot, or a quick time-lapse video in an urban area. But flexible tripods aren’t just versatile, they’re also portable. Most flexible tripods can fit into bags or pockets because they’re almost always less than a foot tall. Inspiration can come at the most inconvenient time, so it’s handy to keep a flexible tripod in the car or in a camera bag! 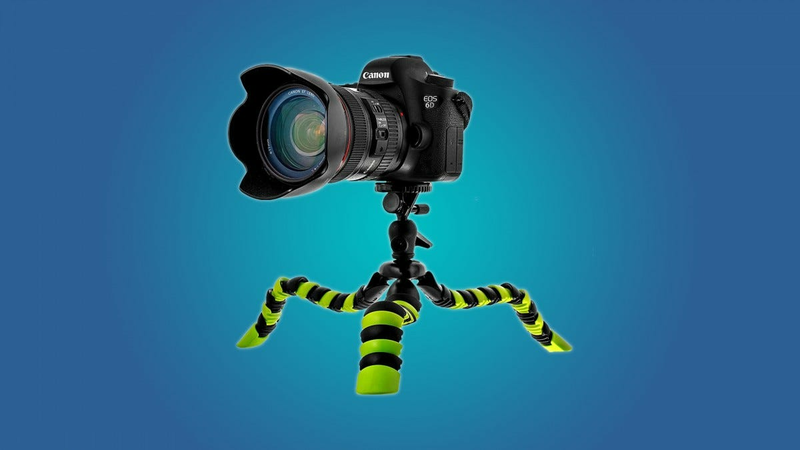 There are a lot of flexible tripods out there, and they all have their quirks. That’s why we’ve combed through to find the best flexible tripods for everybody’s needs. Of course, you don’t need a fancy DSLR to take advantage of a flexible tripod. Your phone probably has a great camera built into it! Some of the tripods that we’ve recommended come with a clamp for phones, but you’ll generally want to attach an adapter to your phone if you want to use a tripod. While you’re at it, you may want to grab a Bluetooth shutter remote to make everything easier. The Joby GorillaPod 5K is the best professional-grade flexible tripod that money can buy. It’s a strong, but very potable piece of hardware. Because it’s made with a durable rubber, the GorillaPod 5K only weights 1.5 pounds. But it can hold up to 11 pounds, which means that you can comfortably attach a large DSLR with a telephoto lens to it. See those awkward, beady legs? They can articulate with a surprising amount of detail in every direction, which means that they can wrap around objects at all kinds of angles or stand on uneven surfaces. Not to mention, you can transform the GorillaPod into a selfie stick, hand-stabilizer, or shoulder rig by adjusting the legs. This is a great tripod for serious photographers and videographers. It’s ridiculously durable and strong enough to hold a telephoto lens, so it’s particularly useful for high-altitude photos and video. The big downside to this tripod is the price point, but would you rather hang your equipment off the side of a building with a $138 Joby or a $54 Joby? 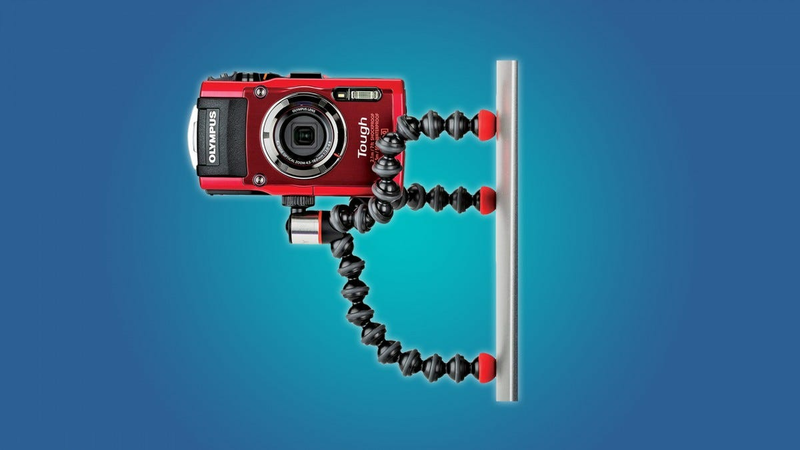 Well, if you’d rather hang you equipment from a $54 Joby, then check out the GorillaPod 3K. It’s smaller than the 5K and it’s a bit weaker. It’s still a great option for somebody who’s looking for a professional-grade flexible tripod, just don’t put more than 6.6 pounds of equipment on it. 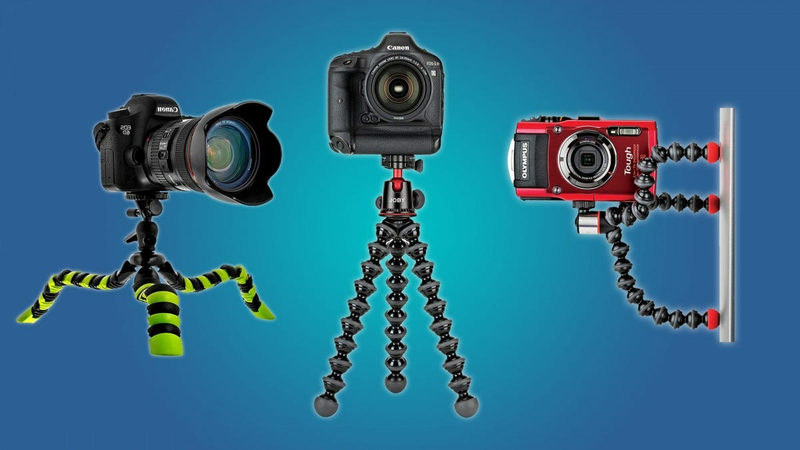 The insect-like Bontend tripod is a durable and cheap alternative to the Joby GorillaPod. At about a foot tall, the Bontend is reasonably portable. It’s also durable enough to hold 6.6 pounds, which means that your DSLR won’t fall when you hang it from the side of a bridge (just don’t weigh it down with a gigantic lens). Like most tripods, the Bontend has a ball head joint, so you can adjust your camera to whatever angle you like best. And if you’re terrible at getting a level shot (like I am), then you can use the bubble-level that’s built into the tripod. The ability to take a stable shot while your camera is hanging from a tree is a blessing, but you could also use that stabilization technology to bend your Bontend tripod into a makeshift hand-stabilizer, selfie stick, or shoulder rig. Oh, and the Bontend comes with extra mounts for cellphones and GoPro’s. Whether you want a lot of options for a cheap price, or just want a cheap alternative to the Joby, the Bontend is a great little option. The LOHA tripod is like the Bontend’s younger brother. LOHA’s cute rubber insect legs are only ten inches tall, and they can only support 4 pounds. That means that it’ll work with most DSLR’s sporting a 25mm or 50mm lens, but anything heavier would be an act of violence against cameradom. Like the Bontend, the LOHA has a ball head joint, so you can adjust the camera to any angle. And with the leveling bubble, you don’t have to worry about your shots being crooked. If you want to use the LOHA as a hand-stabilizer or selfie stick, just close the legs together. You could use this as a makeshift shoulder rig, but it won’t work as well as the longer-legged Joby GorillaPod 5K or the Bontend. If your priority is portability, then you should seriously consider the LOHA. It’s cheap, durable, and small. It can’t carry a ton of weight, but you’ll be fine if you stick to a compact camera or a DSLR with a short lens. This is a great thing to throw in your bag, whether you’re going around town or on vacation. 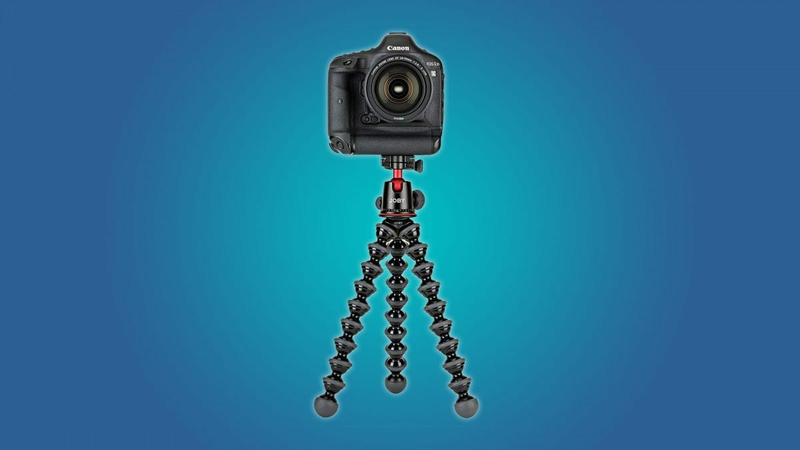 The Joby GorillaPod Magnetic 325 is an incredibly versatile mini tripod. Like the Gorillapod 5K, the Magnetic 325 can stabilize your camera on uneven ground or wrap around objects to give you impossible angles. The 325 also magnetic feet, a unique feature that allows you to stick it to metal surfaces. No, the 325’s legs aren’t long enough to wrap around a telephone pole or even a human head. It works best for very small cylindrical objects, like a towel rack or a tree branch. Really, the selling point of the 325 is its magnetic feet. Because of those feet, the 325 can stick to surfaces that no other flexible tripod can wrap their head around. Imagine getting a photo from the hood of a moving car, or taking a video from the outside of your refrigerator door. This thing’s small enough to fit in your pocket, and it can magnetically snap to the sides of cars or streetlights. It’s a great on-the-go option for people who have small cameras, and especially for people who take their GoPro everywhere. Sadly, if you want to use your GoPro with the 325, you’ll need an adapter. 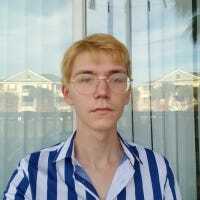 No, this isn’t a tripod. This is a monopod, it only has one leg. It may sound like I’m bending the truth, but the Fotopro Monopod can genuinely keep up with and outperform other small tripods. 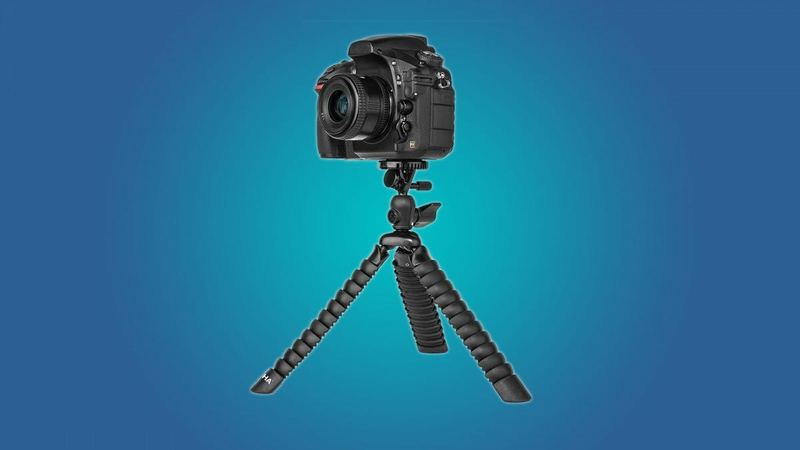 If you want the Monopod to stand up like a tripod, then you can curl it like a snake until it’s standing on its own. Like the flexible tripods, the Fotopro can extend like a selfie-stick, act as a hand-stabilizer, and wrap around poles. But my favorite feature of the Fotopro Monopod has got to be its duel-mounting hardware. There’s a ¼”mount on each side of the Monopod, so it’s possible to mount a phone or camera on each side of the device. Yes, it sounds hedonistic, but that’s how technological progress works. 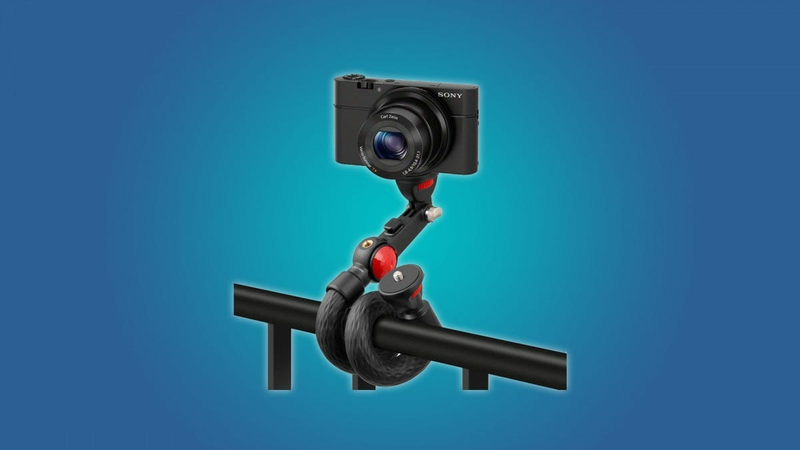 Just think, you can use the Fotopro Monopod to control two cameras at once! Or, if you’re ready to really step into the future, you can use the Monopod to Facetime your girlfriend while watching La La Land. Obviously, this thing can’t hold a heavier camera like a DSLR. And although the Monopod can stand up on its own, it’s not going to perform traditional tripod duties as well as a traditional tripod will. But, it can wrap around a small pole, or the front of your bicycle.